As well as covering the modifications I am doing to my original Paul Smith PS shirt, I also thought I’d share some of my experiences gathering the other off-the-shelf items I managed to grab before they too sold out. 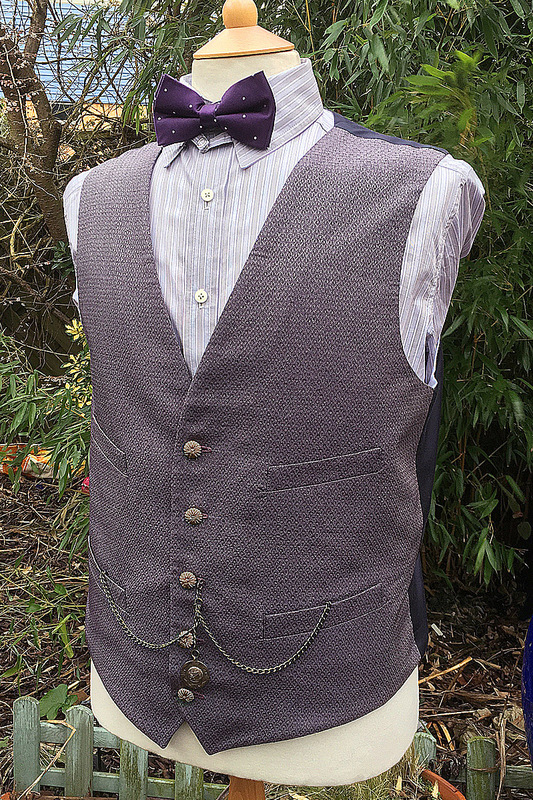 An early read-herring was contained in a BBC News online story called The fashion police on Doctor Who's new outfit. In it the boots worn were incorrectly identified as being Prada. The comment that they had “just arrived in the stores” made them feel very accessible, so it wasn’t long before I was doing searches to see if I could find them. I did see something on their website which was similar, but just not quite the same, with a hefty price-tag attached. 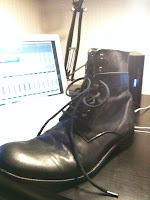 Just as well I didn’t snap them up, as it took the work of a member of the online forums to spot they were actually from All Saints, a chain of stores in the UK, and not Prada after all. The first photo published of the boots (see right) clearly showed an accurate match, right down to the subtlety of the contrasting coloured leather at the ankle, something I had not noticed in the official image. Further postings in the thread quickly showed that far from being “just arrived in stores”, they we actually already last-season and were only available as remaindered items in All Saints autumn sale. 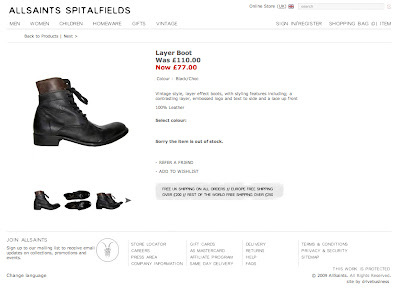 On the upside, they were reduced from their £110 price tag to £77 (see below). All I had to do was find a pair . . . I mentioned in my previous post that as well as modifying my own Paul Smith PS shirt, I have also been looking into making reproductions of the Matt Smith shirt for those who missed out on the opportunity to grab one when they were available. I explained how I had been working on replicating the fabric design using Spoonflower, but quickly skipped to the end so I could show the swatch samples I had created for anyone interested. I promised to write about how I had gotten to that point, and here it is. After the success of the Seven Hatband Hankies, I knew it was entirely possible to scan existing fabric and recreate it using the likes of Spoonflower. As I wrote in the Seven Costume Blog, the hankies had their own challenge, not helped by the original being distorted and twisted out of true when it was scanned. However, patching it together was highly successful, when I had worked out the right technique. For the Matt Smith shirt, I started by doing a good quality high resolution scan of the front of the shirt, making sure to keep the fabric as flat and taught as possible (see left). When opened in Photoshop I made sure it was accurately square and rotated it as needed. Despite the apparent randomness of the design, there must be an established pattern repeat in the fabric. The question was to find it. I picked on a squiggle that was distinctive, and copied an area around it; pasted it back on top, and made it transparent; I could then slide it up and down the fabric until it phased with its repeat above and below. This gave me horizontal guides for the repeat. I did the same for sideways and found the repeat in that direction. I then placed guides here too, isolating the area of the repeat (see right). I allowed myself some overlap to remain which I will fade out so the joins won’t show, but then deleted the rest of the scanned image. 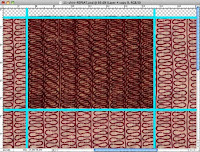 Next was to check the repeat was working, so I copied the area inside the guides and replicated it surrounding the image, creating my own repeat. (see left). At this point it was critical to correct any discrepancy of alignment or repeat. I spent some time until I was happy. 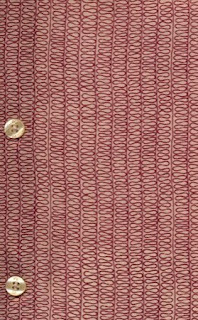 The scan I had been working with included the background colour of the design and showed the weave of the fabric itself. I retouched the isolated repeat to eliminate this, before reducing it to a simple black and white high contrast linework image. I have done it this way so that I can apply a consistent colour across the design. 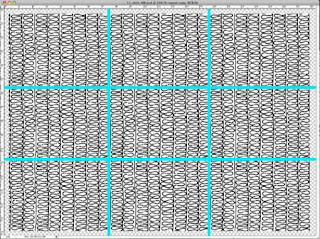 Before applying the colour, I built a three-by-three grid which ‘proves’ the repeat (see right), ready to step-and-repeat it enough times to cover my entire fabric. 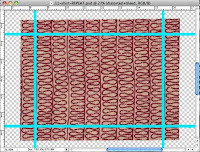 Usually you would only need to provide the isolated area to Spoonflower to do the step-and-repeat online, however, I have a clever little trick planned, so I need to produce a single image to cover the entire area of the print run. Having done all the careful preparation, this was a relatively simple process and I soon had a three-yard length of pattern repeat ready for the next step (see left). In the meantime though, I had some space on the side of a reprint of the Seven Hankies, so I added some swatch samples, which I have made available for sale (see below). If you would like a Eleven Shirt fabric swatch, please PayPal US$20 to tennantcoat@me.com, remembering to include your postal address and a note that you want the swatch. Look out for the next stage of my process to replicate the shirt. Today I start work doing the modifications needed to make my Paul Smith PS shirt (see right) as screen accurate as possible. I manages to get hold of one that fits – which is a bonus! Breast pocket – The Paul Smith shirt has a breast pocket, which is not present on the Matt Smith shirt. 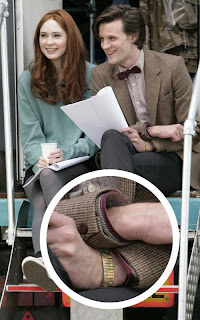 Cuffs – The Matt Smith shirt has a couple of bold burgundy stripes around the cuffs, which are not on the Paul Smith shirt. Button stand – The Paul Smith shirt has a flap, concealing the buttons from view when it is worn, but on the Matt Smith shirt they are clearly visible. I am working on the basis that no-one has a Paul Smith PS shirt for themselves, so I intend to go through these three modifications in as much detail as space permits, which may make them a little patronising. Sorry for this in advance, but I thought it worth covering it all. The first modification I need to make is real simple: the Paul Smith PS shirt has a breast pocket, which is not present on the version Matt Smith wears. I need to very carefully unpick the stitching around the pocket (see above) and remove it in one piece (see left). This gives me a nice fabric swatch sample to use. I have also retained the cotton I removed, as I will need to get a colour reference for sewing later. While I am in an unpicking mode, I now prepare for the next modification, which is on the cuffs. 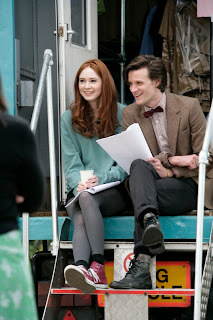 In the first publicity still which emerged of Matt Smith in costume (see right), it is possible to see the cuffs of his shirt. Curiously these are different from the Paul Smith PS shirt, in that they have two rings of burgundy stripes around them (see right, insert). In fact, if you look very closely you may also be able to see that the wiggly line between the stripes does not seem to be as red as the rest of the shirt, instead looking quite dark, almost black. Once I got my Paul Smith PS shirt, the mystery of the cuffs was solved. 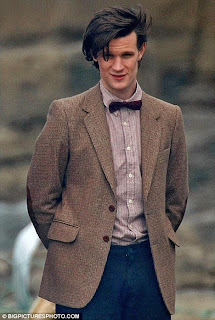 Today seemed like the best day to start this new blog – the first day we all saw Matt Smith in Doctor Who for the very first time. I should quickly point out that this is actually a blog I had no intention of starting or writing! 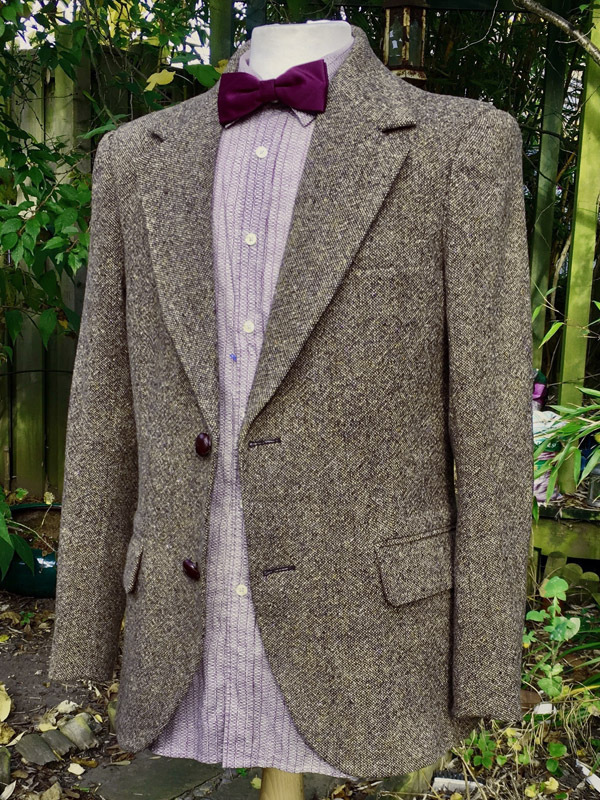 I didn’t feel there was much to contribute to the Eleventh Doctor Costume front, but a series of happenstance came together like a celestial alignment and for me the number of pieces that fell into place made what I am about to do become inevitable! Anyway, as soon as the first image of Matt Smith in costume was revealed in BBC Breakfast on 20th July 2009 (see right), I quickly realized it was a costume that took very little to replicate. 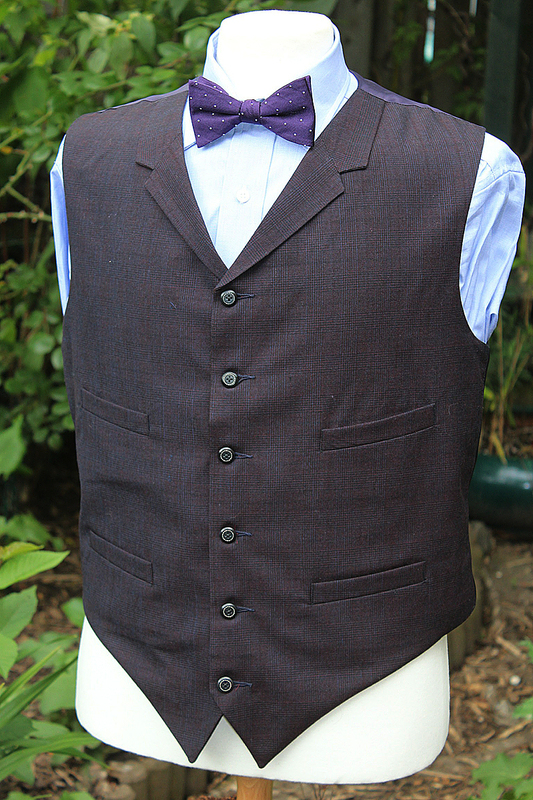 With it principally being made up of off-the-peg clothing, there were few bespoke, custom-made items to create. However, no sooner had it appeared, then the chase was afoot to find exactly what those items actually were. The online costuming forums, when they work, work well! So it wasn’t long before the key items of the costume were identified. All of these items had been gleaned from the then current collections for those retailers, and it quickly became apparent that their time was rapidly passing and they were quickly becoming end-of-line items and hard to track down. I’ll cover my obtaining of the boots and trousers in a future entry, but for now its the shirt that interests me. The shirt was part of the Summer 09 Paul Smith PS collection (see left), and I managed to grab mine through a online site called John Anthony. I usually take a L in shirts, so ordered that, only to get a phone call telling me they had sold out. They did, however, have the XL, so I switched to that instead. Just as well, cos when it arrived it was a snug fit! Once various people started getting their hands on the shirts, they soon spotted three minor subtle differences. 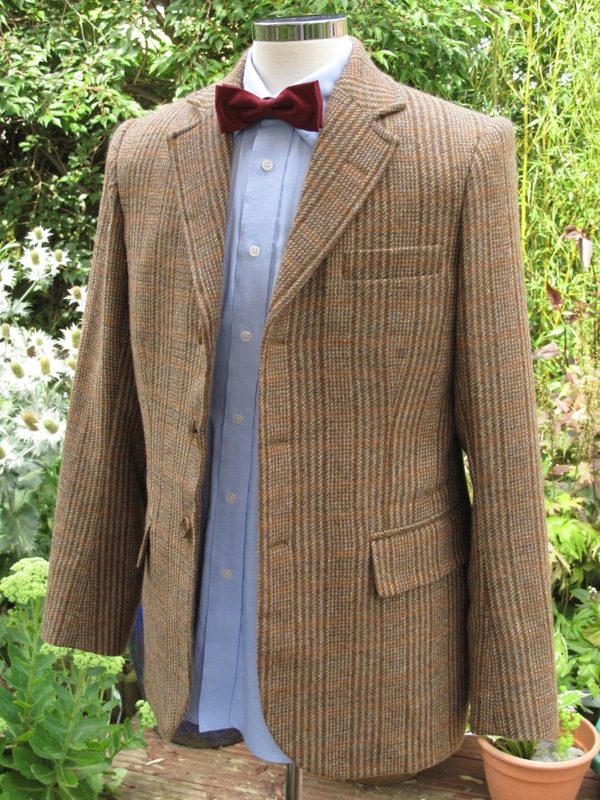 My opinion is that these modifications were made to differentiate the Matt Smith shirt from the Paul Smith original. 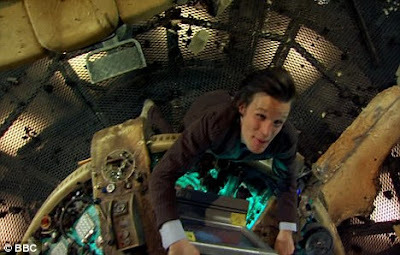 Well, now the Sonic Screwdriver has been handed over to Matt Smith, the Paul Smith shirts are impossible to find and are becoming as rare as hen’s teeth. What I need to do now is perform the same modifications to my shirt, in the same way the costume department did to theirs. Check back soon to see how I get on . . .